No one can tell me there is no God. He has performed too many miracles for me to believe that foolishness. For example, for at least the last 14 years of my life I have been watching/listening to Pastor Bill Winston who is based out of Illinois. I’ve been wanting to meet him and hear him preach in person for years. However, I live in Texas and his church is in Illinois. Well, finally I decided it was time to book a flight and go see him. A week before I was to fly to Illinois, I saw that he was scheduled to be in Africa two days before I was scheduled to attend his church. So I was worried I wouldn’t see him. But I was determined to go anyway. I figured even if he wasn’t back from Africa or decided not to preach, I would still step foot in his church and listen to whoever ended up preaching. Well to my pleasant surprise, Pastor Winston did indeed end up preaching and not only that, he and his staff showed me so much favor that I didn’t ask for. For starters, Justin, a kind member of his staff, gave me a grand tour of the church property, and Kaneesha (another kind member) (over the Prayer Call Center) gave me a tour of their prayer room. I got to actually meet Pastor Winston and without me asking, he prayed for me. And the cherry on top, I was blessed to sit on the front row of the church and got to hear Pastor Winston preach. I also was blessed to meet his son (Pastor David) who is over the Go Hard For Christ Youth Ministry. Noone knew I was coming and noone knew me at all! Yet, I received special favor! I’m not some famous pastor. I’m just little ole me. To God Be The Glory!!! WOW!! God really did a great thing for me. My whole trip to the area was very fulfilling. If you get an opportunity to visit Bill Winston’s Living Word Christian Center, I highly recommend it! The staff, congregation, pastor, and entire atmosphere are very nice, positive, and empowering. If you don’t know anything about Pastor Bill Winston, I’m telling you he is the real deal. 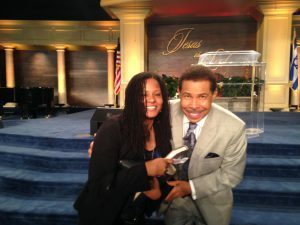 He’s truly anointed but here is where you can find more information about him and his anointed ministry. If you have the opportunity to pick up his book “Faith & The MarketPlace”, I recommend it. If you know someone who needs to give their life to Jesus or even rededicate their life to Jesus, Pastor Winston can help with that as well. Here’s A Special Prayer Of Protection Just For You! I’m excited to share, we have added a special prayer for protection just for you. Just go to the following link on this site and type your name or the name of someone you care about. Then hit the “Submit” button to see your special prayer. Bill Winston encourages us to say this powerful morning prayer daily! To find other videos and sermons by Bill Winston click here. Jesus is the real deal. He is the truth. If you haven’t made him your Lord and Saviour, time is really running out. You need to do so TODAY! Friend, if you know anyone who needs to make Jesus Lord of their life, I invite you to share this message. Let’s provide salvation for the unsaved. Let’s encourage salvation from sin. Time is short!